As the Pacific Northwest starts moving towards Spring, many of us are able to get out and enjoy the sunnier weather. Soaking up some rays is just as important for older loved ones, too. But make sure to take some precautions before heading out to take in the day. Even in short bursts, a little bit of Vitamin D – provided by sunlight – can go a long way. Vitamin D can help the body by increasing bone growth and strength and lowering the risk of disease, and after several months of being cooped up inside, a little bit of sun can even help with depression. 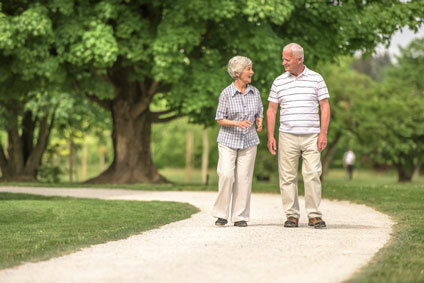 Additionally, walking around the neighborhood or going to a park can also spur conversations with neighbors and other socializing, vital for keeping spirits up. Walking around the neighborhood or going to a park can also spur conversations with neighbors and other socializing, vital for keeping spirits up. For some, putting on a warm coat and taking an outdoor stroll requires little more thought than opening the front door. For others, particularly with mobility or other issues, a little more planning is needed. With April showers bringing May flowers, some surfaces may be wet with rain and cause a potential slipping hazard. Depending on the how long a senior wants to be outside, dehydration could be a factor too, so remember to bring some water for the trip. Start choosing a path now if a walker or wheelchair are needed to get moving. Rough sidewalks – or no sidewalks at all – can be troublesome for those with mobility issues. If a quick stroll around the block becomes too much of a hassle, or just too difficult, these much needed bursts of sun and activity may be abandoned altogether. In the weeks leading up to the warmer weather, older loved ones can start strengthening muscles with chair exercises and other indoor physical activity to get ready for the upcoming sunny excursions. For many of us in the Pacific Northwest, dealing with the cold, wind, and rain is just a fact of life. But when the sun finally starts poking through, it’s important we all make the time to enjoy it. Especially for seniors, even if it takes a little planning to do so. The Knights of Pythias Retirement Center is conveniently located in downtown Vancouver, WA. Our location offers many opportunities for residents to get out and about all year round. Contact Knights of Pythias Retirement Center to schedule an appointment or for more information.